Display of MRS structures (Minimal Recursion Semantics; see the RmrsTop pages) in LUI supports various views, viz. (a) simple, (b) indexed, and (c) dependency formats. All three views display the exact same object but vary in the amount of information provided (and accordingly the compactness of display). Furthermore, display of scope-resolved form(s) of an MRS is supported by calling back into the LKB built-in MRS display code (on select platforms). The following sections briefly comment on each of the three native LUI views for MRSs. The simple view on an MRS is closely related to browsing a feature structure, in fact using the LuiAvm widget for display purposes. MRS variables are represented as node re-entrancies, and the AVM widget facilities for highlighting and `chasing' of re-entrancies can be used to follow linking across EPs. Nodes representing variables are shown collapsed by default, and the standard AVM mouse bindings (left-click on the variable name) work to expand MRS variables, in order to display variable properties. Since simple MRS display re-uses the standard AVM widget, it inherits all of its pop-up menues. Note that, in some cases, menu commands like Type Hierarchy or Show Source will be available but have no meaningful semantics, viz. where the `type' label shown in the AVM widget actually corresponds to a simple string in the MRS. The indexed MRS view assumes order-coding for argument positions; thus, elementary predications look somewhat more like a traditional, logical-form representation, and display requires quite a bit less screen real estate. Compactness in indexed view is further increased by reducing the display of variable properties to just the values, i.e. omitting the names of properties themselves. The assumption here is that property values like past or sg can easily be interpreted. Furthermore, variable properties are only shown on the first occurence (with respect to the linear rendering of the display) of each variable. 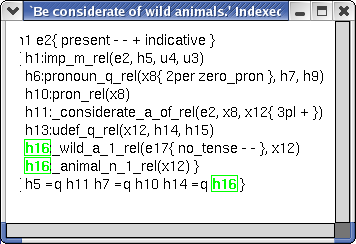 The indexed MRS browser uses the LUI extended text widget, and elements corresponding to logical variables are mouse-sensitive: mousing over variables will highlight all occurences of the same variable.